Revo® Portable Bag Closing Machines (Models DA, DAD, DA2T) can be easily and economically used with the Revo Suspension Unit without loss of portable features. It is the best solution for minimizing operator fatigue as it keeps the machine safely suspended above the working area. 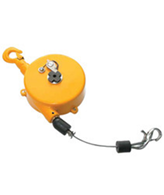 Ideal for occasional bagging, the suspension unit holds the machine up until required for use by the operator. The machine is then pulled down to the bag top level for use. When released, the durable spring-loaded suspension unit retracts the machine back to its home position. The Suspension Unit also prevents accidental damage of the machine and can be removed with ease for use elsewhere.